Industrial bimetallic thermometer, particularly suitable for ovens, heating plants, solar systems, manifolds and heating appliances in general. Industrial bimetallic thermometer, particularly suitable for ovens, heating plants, solar systems, manifolds, and heating appliances in general. 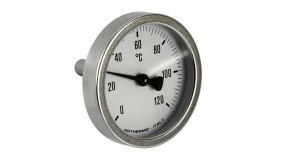 Bimetallic industrial thermometer. Particularly indicated for ovens, flues and heating plants.